Riverwalk features a ‘village-style’ layout of 9 blocks of 193 high-specification apartments on a stylishly landscaped 7-acre site. Student accommodation during the college term, these apartments make the perfect holiday destination during the summer months. Riverwalk is located on the inner Ring Road in Waterford City. It is located on John's River which winds its way through the city to The River Suir at Adelphi Quay. Riverwalk features a 'village-style' layout on a stylishly landscaped 7-acre site to further set it apart from modern residential accommodation. Riverwalk has been designed and built to the highest standards and includes high quality fittings, furnishings and equipment which considerably exceed normal specifications. Laid around an attractive internal courtyard to help create a community atmosphere, the apartment blocks are surrounded by extensive open spaces which will incorporate an all-weather, multi purpose sports pitch and dedicated running track. Riverwalk has been designed and built to the highest standards and includes high quality fittings, furnishings and equipment. 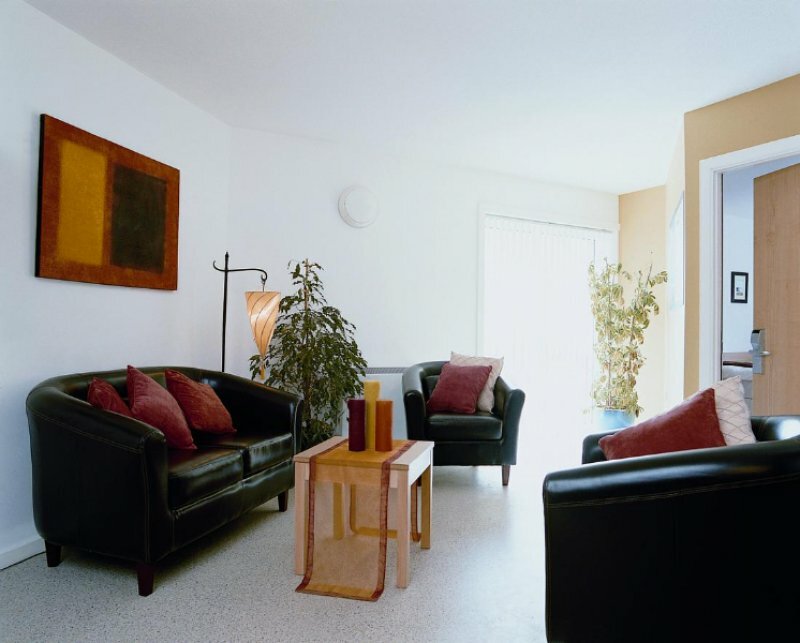 Retreat to a comfortable and spacious area which is designed to be a tranquil and relaxing environment. 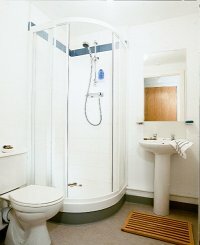 All bedrooms are en-suite and are partly tiled and easy to maintain. Cots or highchairs are not provided at the apartments. 15 minutes walk from W.I.T. If you're looking for good food and entertainment, Waterford offers a wide choice of restaurants, pubs and nightclubs. Waterford’s position on the south-east coast offers good access by sea to Britain and mainland Europe. Roads are set to improve further during the next five years, with the upgrading of the N9 between Waterford and Dublin and the construction of the Waterford City Bypass. Compete at the Regional Sports Centre (Pitch & Putt, Sports Hall, and Athletics Stadium) and see the Super Blues in action! Top live music acts every weekend in venues such as Ten and The Forum. A non-refundable reservation deposit of €100.00 is payable at time of booking and forms part of the hire charge. The balance of the total rental + €100.00 refundable damage deposit will be due and payable four weeks before the date of commencement of the holiday. Full payment is required at the time of reservation, when such is within four weeks of commencement of the holiday. A €100.00 refundable damage deposit is required to cover any possible loss/damage/breakage and excess cleaning etc. THIS SECURITY DEPOSIT WILL BE RETURNED (provided the supervisor is satisfied that the terms and conditions of rental have been complied with) WITHIN 7 DAYS AND NOT ON THE DAY OF DEPARTURE. PLEASE NOTE THAT ALL REFUNDS WILL BE MADE BY WAY OF A CHEQUE OR CREDIT CARD REFUND ONLY. Cancellation policy: If a client cancels:· 4 weeks or more before arrival date €100 deposit forfeited.· 15-28 days before arrival date 25% of the price forfeited, or €100 deposit, whichever is greater.· 01-14 days before arrival date 75% of the price forfeited, or €100 deposit, whichever is greater. · Non arrival 100% of the price forfeited. The apartment must be LEFT AS IT IS FOUND and the cost of repairs to or the replacement of property will be the responsibility of the client and when applicable deducted from the security deposit. Clients are expected to leave the apartment clean and tidy otherwise an appropriate charge will be made (minimum charge of €25 applicable). There is an EXTRA CHARGE FOR ELECTRICITY which is payable by the client on departure. The apartments must be occupied between 4pm and 6pm on day of arrival and must be vacated by 11am on day of departure unless alternative opening/occupancy times are confirmed in writing. Alternative arrangements can only be facilitated strictly by prior arrangement with management. It is recommended that the clients telephone the supervisor in advance to confirm the exact time of arrival. FAILURE TO NOTIFY THE ON-SITE SUPERVISOR OF LATE ARRIVAL COULD RESULT IN LOSS OF RESERVATION. THE COMPANY IS NOT RESPONSIBLE FOR ANY LOSS OF VALUABLES OR PROPERTY LEFT IN THE APARTMENT OR ON SITE DURING THE STAY OR ON DEPARTURE. 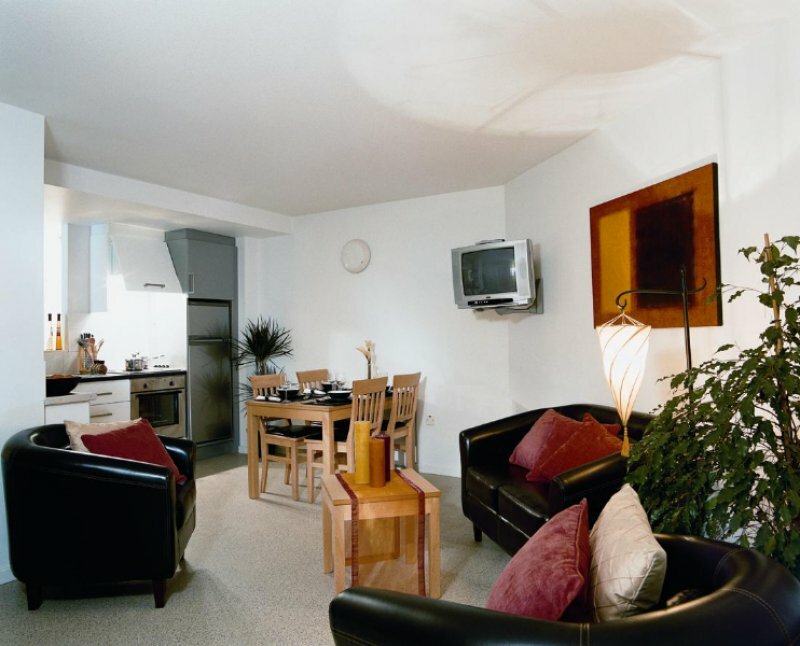 Standard insurances are in place within the complex, but these insurances do not cover the loss or damage of any PERSONAL BELONGINGS taken into the apartments by holiday makers. Should your own household policy or holiday insurance not cover these items please make other arrangements. The supervisor or any officer may at all times visit the apartments during the stay or departure. In the unlikely event of a complaint, this must be made to the supervisor immediately and if not rectified details must be forwarded to the company within 7 days. No refund will be made if the client is requested to leave the apartment or leaves of their own accord before the expiration of their booking. The management reserves the right to refuse to hand over any apartment to any person who, in the opinion of the management, is not suitable to take charge. Likewise, rental of the apartment may be terminated with no refund at the discretion of the supervisor or any officer of the company if clients/occupiers behave in a disruptive manner, cause a nuisance or disturbance, cause damage to the property or in any other circumstances deemed reasonable by the supervisor or any officer of the company. Bookings will not be accepted from parties less than 21 years of age. Proof of age will be required before an apartment is handed over. Bookings are not accepted from all young males and/or all young females. No pets allowed, except guide dogs. There is a strict speed limit of 10mph on site.